Calling myself a digital poet is both bizarre and wondrous. 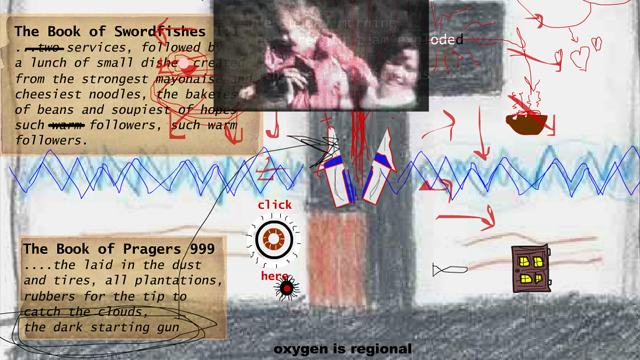 I build/birth all manner of strange interactive creatures where the user-reader becomes player and co-author. Explore and Play and Lose Yerself! 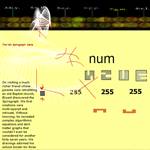 An interactive poem-­‐artwork hybrid examining the abundance of taxonomies and the near infinite number of interconnected biological systems in the environment, and explored through an interactive 3-­‐D depth interface. To understand, to translate the world, the objects and creatures and geographies around us, the near infinite number of systems, abundantly expanding and contracting, into meaningful symbols, shareable concepts, we developed language. Then to further understand the differences and similarities of everything around us, we created labels, categories and systems of taxonomy. And while these developed taxonomies and hierarchies are useful to organizing and departmentalizing our complex biomes and biology, they can also hinder new possibilities and understandings. What if defining the function of the lung or leaves limits alternative and possibly powerful uses, keeps us from exploring what some might call “fringe” science. 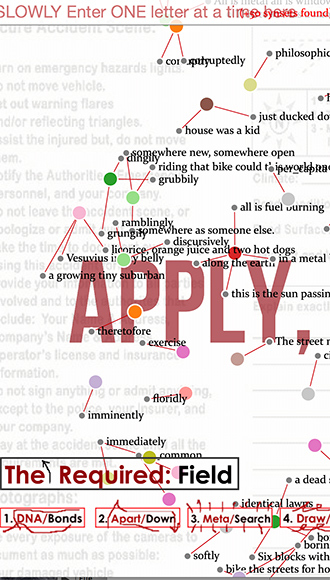 The Required Field is an expansive interactive digital poem exploring the impact of policy documents, bureaucratic forms and the river of applications on our lives and our daily culture. 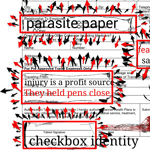 Using twenty found and remixed government and corporate documents, the work poetically translates those overly complex and confusing forms. 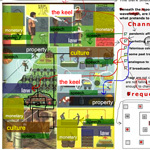 For example, a Tax Form for farmers will be recontextualized through an interactive image-­‐map tour, transforming specific sections of the forms into poetic text and animated elements. 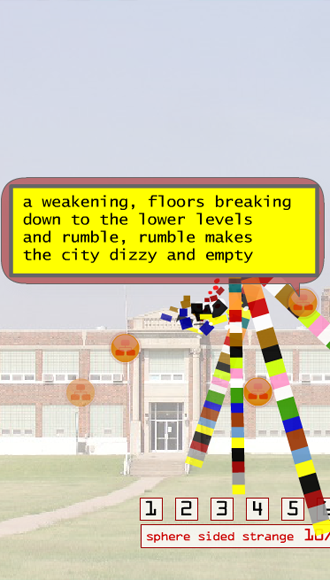 Or a page from a Work Visa application will be created into a platform game, where the reader/player triggers poetry blasting bureaucracies through their game play. And in the end, The Required Field, builds from and then poetically destroys the bureaucratic cultures and their fields of red-­‐tape, laws and policies for the sake of policies, the sub-­‐section to a sub-­‐section, part B stroke 9 for breathing. 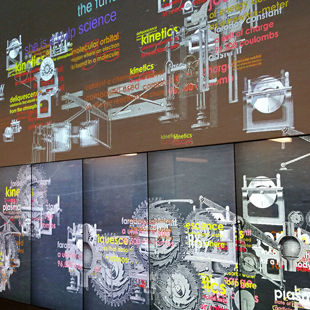 Cryptext (an interactive puzzle/science fiction mystery game) and Nomencluster (a generative artwork/game created by user’s hand movements using poetry and science designs) were built for one of the world’s largest, most advanced touch screen spaces, located at QUT’s The Cube (four 40ft sides, over 40 touch screens, towering over two stories). 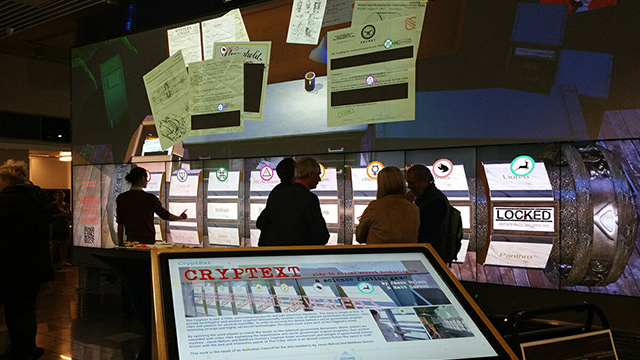 Cryptext, a puzzle science fiction game, where players use giant wheels, one to each touch screen, to solve a cryptic X-files style mystery surrounding a secret military technology program. 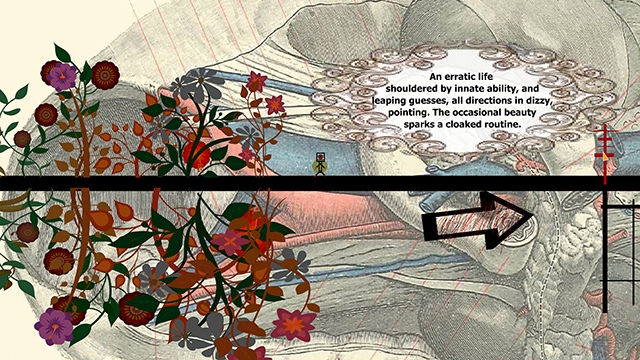 And Nomencluster an interactive artwork/game where players create with science shapes and designs, and through each of the six levels poetic text is generated by the player’s movements. 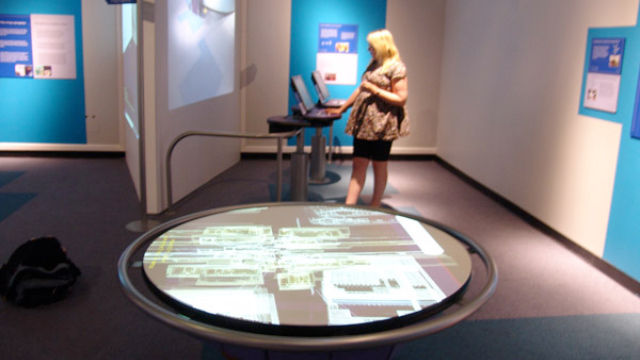 The Tech Museum in San Jose, California ran a contest for Exhibitions conceived in Second Life, with the winning interactive artworks being fabricated and included in the Exhibition. I won for an interactive Table that functioned as a mouse and allowed users to move the artwork by moving the table through a series of servos and a projector. 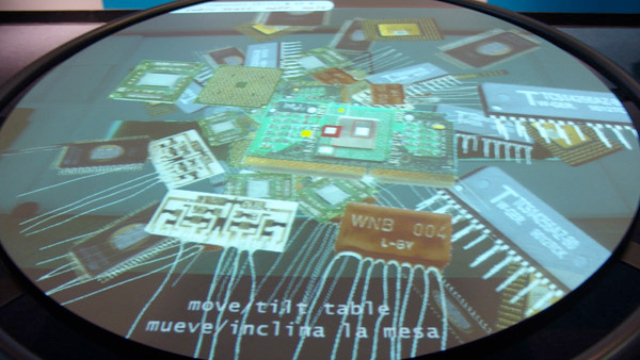 The artwork itself was a combination of poetic content inspired by the history of the Silicone Valley and a rethinking of the roles of numerous "turning point" technologies such as the mouse and the first portable PCs. 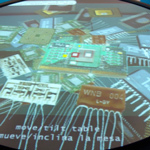 The artwork was praised by both the inventor of the mouse and Moore of Moore's law who were at the opening. 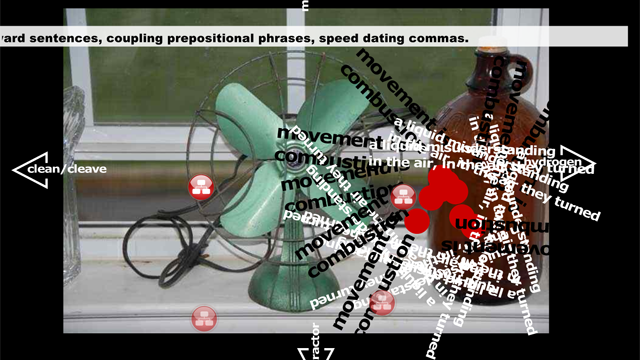 Entropic Texts is an experiment in using text, image, and an interactive interface, to explore the notion of entropy. Entropy is nature’s tendency towards decay. Thus, it is entropy that predicts the arrow of time, and the length of the life of all things – living and material. As you scroll through this artwork, you are lead into a world where the ‘force’ of decay gets slowly stronger, to the point where text, images, and moving image, become glitched and decayed beyond recognition. This imaginary world of quickening decay is represented by the junkyard. What we often call junkyards are spaces that were once collections of adored or useful items, that have succumbed to entropy, thus they are both clear metaphorical and physical spaces of decay. Using a combination of the artists’ own poetry written while visiting junkyards, and generated text, we seek to experiment with the life and decay of digital data. 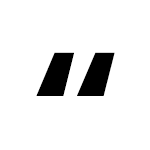 This work is intended to be read both ways. 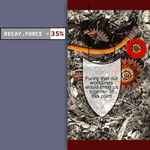 Once the end is reached – 99% decay force, the piece can then be scrolled back through, reversing the arrow of time, and thus reversing entropy.The act of creating a digital interactive artwork feels a lot like fighting with the forces of entropy – as an artist you are creating a work that is constantly attempting to break itself. 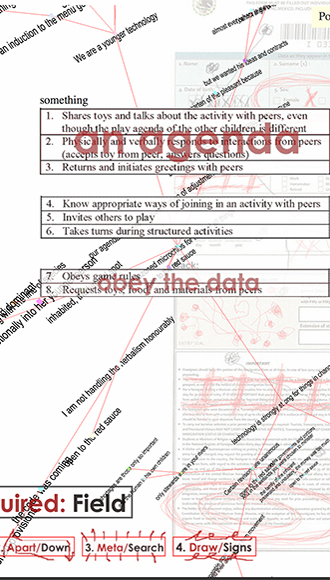 Sometimes a large portion of the artist’s role is to resurrect broken data. This process of creation and destruction of data, while central to our theme, was also self evident in the creation of the work itself. Statistical data is often coldly displayed, used for factual representations. 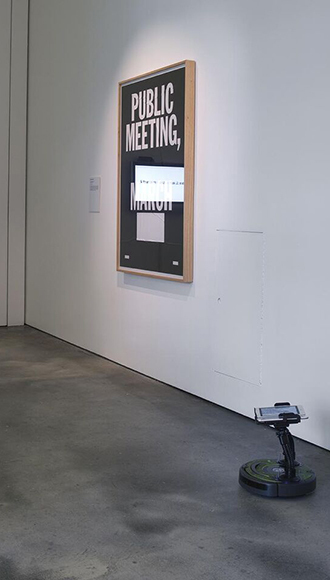 Graphoem: Video graph Fictions recontextualizes graphs and other data through interactive interfaces to create a series of fictional artworks exploring pop-culture. Few digital fictions have layered fiction over video driven by responsive graphs, and this work pioneers the intersection of pop-culture and digital poetry expression. 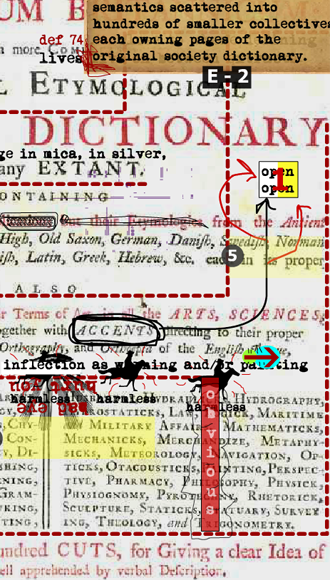 Indeed it is often cited as one of the first digital poems to use statistical data as the driving narrative force. This kind of re-mixing of formats is integral to contemporary new media arts and electronic literature. The ability to venture towards, avoid and then circumvent unwanted obstacles, certainly when combined with the delivery of poetic content, might be considered evidence of life, sentient, semi-intelligent life. And yet the whirling motor hum coming from a small circular creature, arms with touch screen hands reaching up from its back, roaming around the room is only a half-life. 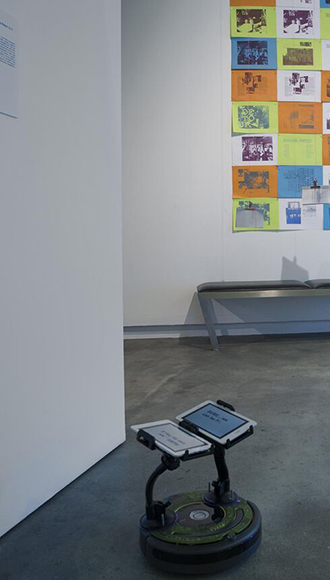 The Poetry Robot doesn’t understand or, dare I say, even care about gallery visitors watching/reading the textual wonders it shines up from LCDs. It doesn’t know or feel bonded to its digital poet creator. Its only desire is to move, avoid and feed/recharge. But still, we wonder. 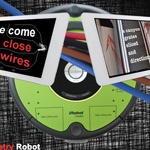 Is the Poetry Robot a lost adventurer? Are the words and images coming from its prayerful hands/screens expressing fear and desire, a frustration with its ability to understand. 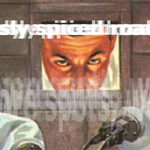 Or perhaps it is trying to find us, to warn/advise us of a future where life in redefined in binary and servos. 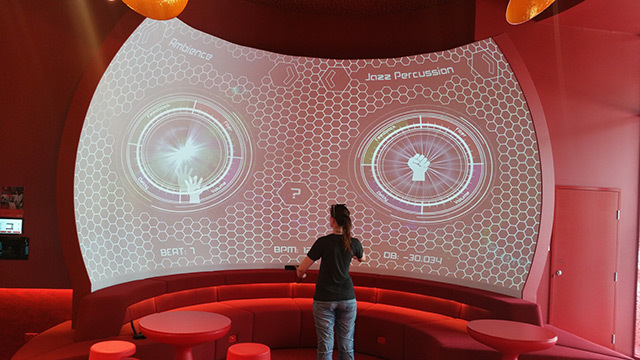 The challenge was to create interactive artworks using sensors, interactive interfaces, screens and other methods for the new visitor centres at Griffith University. 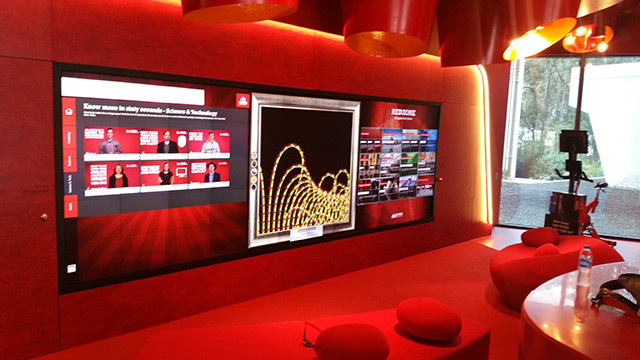 These Red Zones are designed to be compelling spaces to entice visitors to engage with the scientific, medical, humanities and artistic research of Griffith Academics. I create two large scale works to function within the unique constraints of the space. 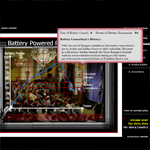 “The Bafflement Fires” is a digital recreation of a Freemason board game from the 1950s. 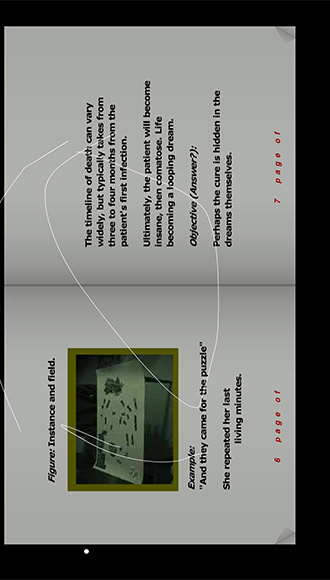 Based on found documents, the game, built by a psychologist and Mason, was an attempt to alter player’s perception through quiz and play. While it appears some of the game was lost/destroyed, enough was there for me to create a largely accurate videogame version. Exploring methods for transforming quizes, tests and other forms we continually encounter, this work builds a world through bizarre, seemingly surreal questions and answers through the lens of found ficto-history. Within every human there is a singular gene, unique only to that individual. And with that gene comes a singular ability, a rare, mostly never realized capacity for interacting with the world. 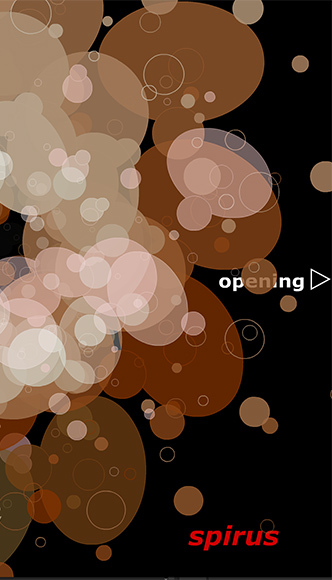 The Bomar Gene explores this mythical gene, through a series of ficto-biographies, with each story being retranslated and spatialized through interactive interfaces and embodied animations. Each section opens up to such questions as: How are we defined by our genetic code? What does it mean to be an individual, to be unique? What are the implications of a society obsessed with rare abilities and super-powers? 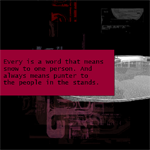 An interactive fiction/poetry hybrid. Awards/Publications: ACM exhibition in Singapore (2005), The Iowa Review Web, University of Iowa (2006). Under consideration for the Electronic Literature Collection (University of Maryland, UCLA) volume two. 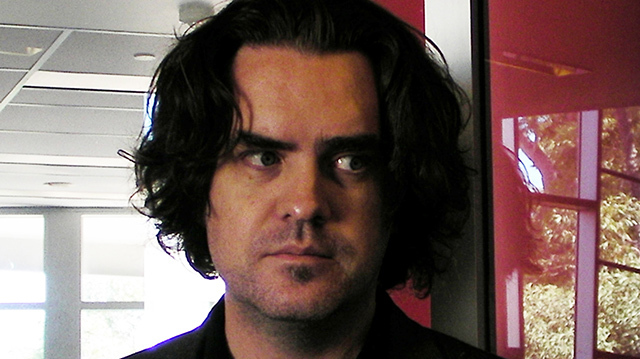 Winner of the 2008 "Ciutat de Vinaròs" Award on Digital Literature in Barcelona. With every major event, every natural disaster or societal change there are a multitude of visions, thousands lenses documenting the experiences, the victories and the challenges. 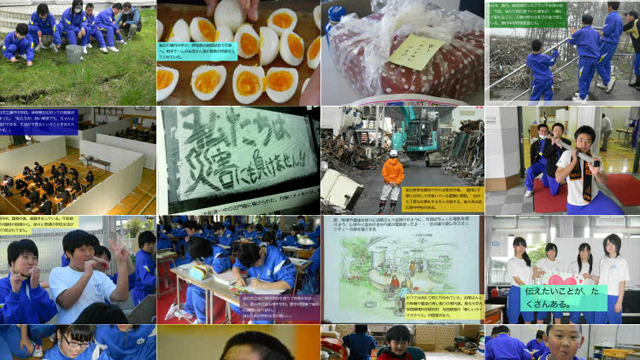 “Messages for our Future” recreates these visions through an interactive mosaic digital artwork which uses hundreds of images and poetic/enlightening texts captured by the citizens and students from the Japanese tsunami impacted city of Tohoku. Armed with cameras they captured scenes of rebuilding, of a hopeful future amidst the rubble and damage. Each of those images is a story, a forever inspiring narratives, and the artwork recombines them, forming compelling mosaic combinations with each exploration. Every time you move your mouse and click, you can explore new images and see new relationships between the stories, to infinitely zoom through a webbed mosaic of images and poetic texts. 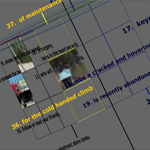 To explore, simply mouse-­‐ over/navigate to an appealing are of an image, click and click, read, contemplate connections and repeat, an interactive zooming/clicking interface. 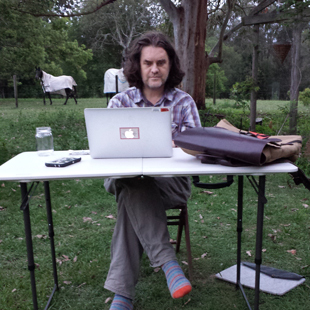 2015 Jason Nelson in his Australian office. 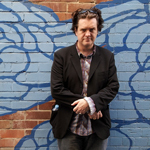 Born from the Oklahoma flatlands of farmers and spring thunderstorms, Jason Nelson stumbled into creating awkward and wondrous digital poems and net-artworks of odd lives, building confounding art games and all manner of curious digital creatures. 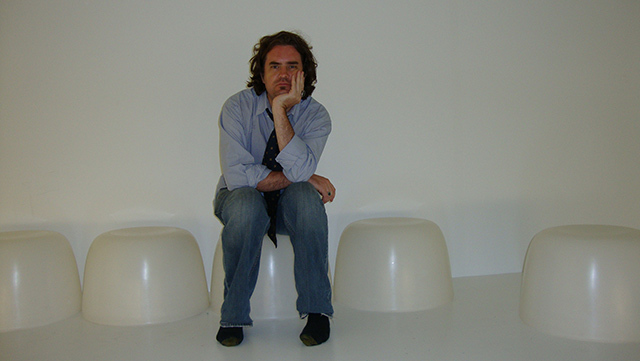 Currently he professes Net Art and Electronic Literature at Australia's Queensland College of Art within Griffith University in Brisbane. Aside from coaxing his students into breaking, playing and morphing their creativity with all manner of technologies, he exhibits widely in galleries and journals, with work featured around the globe at FILE, ACM, LEA, ISEA, SIGGRAPH, ELO and dozens of other acronyms. 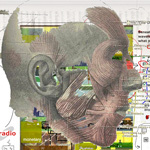 There are awards to list (Paris Biennale Media Poetry Prize), organizational boards he frequents (Australia Council Literature Board and the Electronic Literature Organization), and numerous other accolades (Webby Award), but in the web based realm where his work resides, Jason is most proud of the millions of visitors his artwork/digital poetry portal http://www.secrettechnology.com attracts each year. Happily my work deserved a Wikipedia entry. 2010 i made this. you play this. we are enemies. 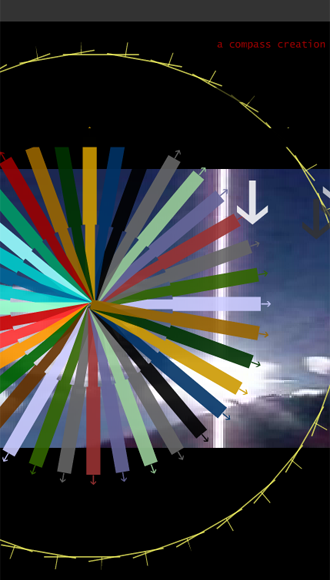 IMTYPTWAE is an art game, interactive digital poem which uses game levels built on screen shots from influential community based websites/portals. And using messy hand drawn elements, strange texts, sounds and multimedia layering, the artwork lets users play in the worlds hovering over and beneath what we browse, to exist outside/over their controlling constraints. Your arrow keys and space bar will guide you, with the occasional mouse click begging for attention. 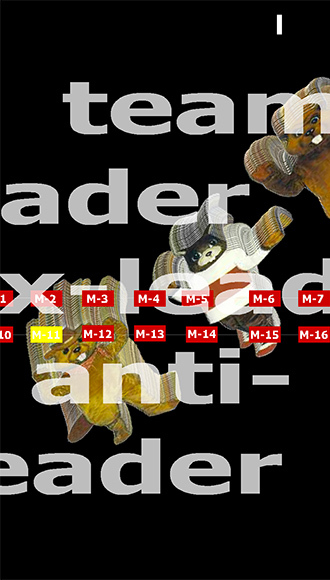 GGGAG is a digital poem, game, and anti/pro-design statement. 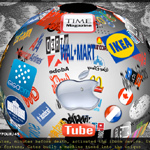 The western world’s surroundings, belief systems, designed culture-games, create the built illusion of clean lines and definitive choice, cold narrow pathways of five colors, three body sizes and capsule philosophy. Within new media art the techno-filter extends these straight lines into exacting geometries and smooth bit rates. This game attempts to re-introduce the hand-drawn, the messy and illogical into the digital, via a retro-game. Hovering above and attached to the poorly drawn aesthetic is a personal examination of how we/I continually switch and un-switch our dominate belief systems. 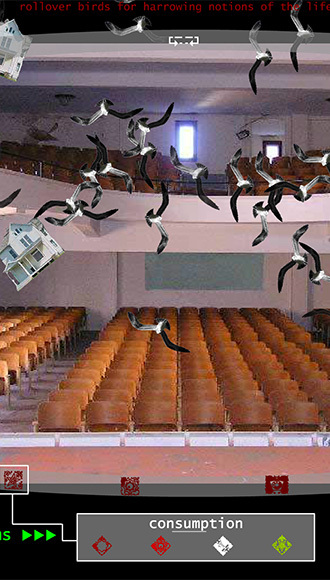 Moving from faith to real estate, from chemistry to capitalism, triggering corrected poetry, jittering creatures. Our webscapes and netvilles are increasingly dominated by short bursts of emotional language, brief stabs of charged textual opinion. And every minute those words build small cities of influence, beauty and terror, creating brief communities of poetic power. 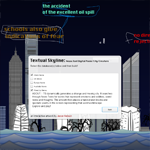 Textual Skyline explores these notions through a net¬-based interactive, generative and multidimensional flash engine/interface using RSS news feeds to create a digital poetry city. 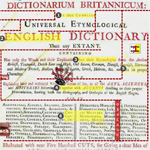 To create these strange cities actionscript code searches through designated news feeds for specific words or phrases that represent emotive states (death, victory, love, profit, attack, defend and a few hundred others). Then for each charged word a building block is placed on the screen, two layers deep, forming a skyline of poetic text and art. 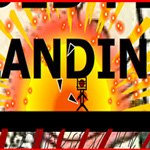 Additionally, each of the text blocks contain animated, hand drawn and other multimedia content. 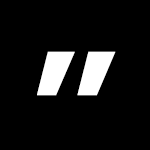 The finished work lets readers/users load RSS feeds from a variety of net communities (really any site with such a feed can be used), and as those feeds change so to will the digital poetry city (on reload). 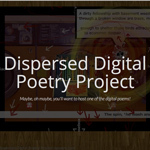 Digital poetry should surround the reader, to encompass them in the experience, to entice their hands and eyes to move with the language and explore the interface. It’s critical for digital writers to see the interface, visuals, sounds, and movements as poetic/fiction elements. Multimedia and interface components are not just navigational holiday lights to pretty up the place, they add/change/expand the artwork. Within this work, I designed a responsive creatures as both fun to play and allow the reader to jump between texts, to read in their own ordering, to non-linearly explore the inherently non-linear nature of poetry. Layering is also of prime importance, as creating a sense of thematic and visual depth, embeds the poetry in a larger world, a more complex poetic. 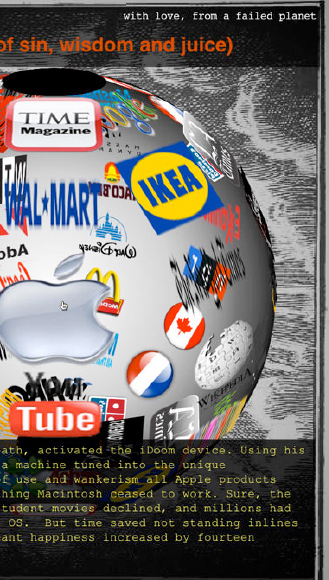 An interactive logoed world populated with 45 strange and fantastical stories of the societal/cultural failure of influential net portals, fast food giants, newspapers, airlines, manufacturers and other oddities. 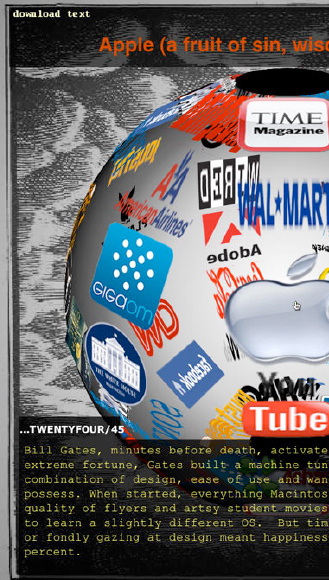 And Huffington Post is included! Initially I had assumed the creation of this net-artwork would be risky, as some of those whose end I forecast might sue. Oddly, these folks must be pleased with my depiction of their end. This work will be published in the innovative net-based poetry journal Cordite Review. City Forest and the Sandy End from Jason Nelson on Vimeo. An experimental animation using a game engine to forecast a future where our coastal environments fall into the sand as gloabl warming seeps away the land. Creating digital art is often an exercise in finding new methods for using software. 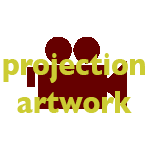 An artist has a vision or direction and has to coax software/code/technology into creating compelling works, to find a path through the unknown, the myriad of screen capture/animation/3-d world/game engine packages and build/birth innovative Machinima art.  Machinima is a video art form exploring animation as a sculptural and conceptual framework and the result is a combination of poetry, video game 3-D animation and moving sculpture, experiments with a new digital/artistic language. Thematically, these works explore the tenuous and fragile nature of urban environments up and down Australia’s crowded eastern shores. These cities so close to the ocean, in a few hours, from waves or wind, their ordered cityscape could be rearranged into toppled buildings and urban objects buried in a sandy garden. This is a strange work. Not for the content, as many of my works are considered strange. But rather the artwork itself is both incredibly original and amazing, but also greatly flawed. So it's a combination of failure and success. This could be considered a near unplayable art-game. 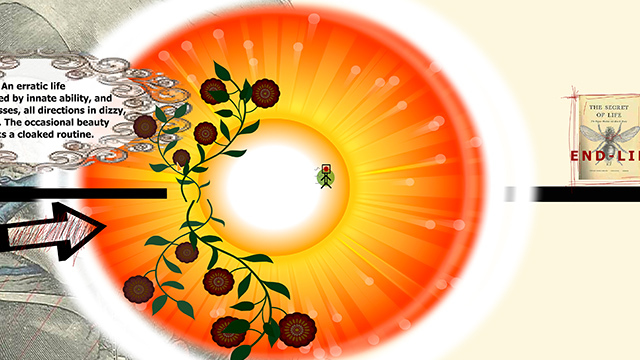 Each level is built to be both won and lost, where the player shoots strange enemy objects with increasingly absurd and broken guns, and wildly deviating scoring systems. Behind the experience are odd hand-made videos of toy play and between the levels are narrative clips told with old matchbooks from small towns of the prairie. With perhaps the best title ever given to a game or otherwise, ATANLZ is both disrupted art-game and experience in frenetic madness, an interactive collage engine born from the pixilated undead. Widely reviewed in such publications as "New Literary Hybrids in the Age of Multimedia Expression" by Marcel Cornis-Pope and "Literary Gaming" by Astrid Ensslin as well as across the internet from Engadget to the gaming and art portals. Using speech to text software trained to my scratchy and yet (in the afternoon) velvety voice, I process the worlds of media (movies, radio, music, crowds, the ocean). 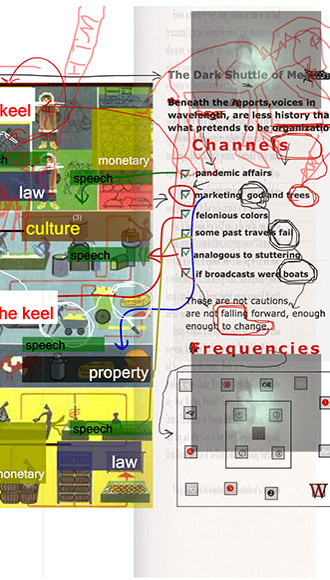 The software, as all technology, is an imperfect and jealous lover that misunderstands explosions, or ambient noise as text, and retranslates the sounds and dialogues, finds hidden words beneath what we (and it) hears. Think of the process as an interpretive dance, a jittery technological oracle for our electronic boxes that shine out uncertain media prophets. These poems are the first in a series of noise to poetics experiments. Six Sided Strange is a net-artwork series built from unsolvable Rubik's cubes and hidden narratives, from pixilated game character collages to abstract streams of color and lines. The cube is central to how we organize and understand. It is a puzzle of unsolvable junctures, a humanistic shape created to order and organize. Six Sided Strange disrupts the cube, wandering inside/around the recombinatory playground of Rubik's 56 squares, exploring how images and designs relate to narrative. These are interactive/dynamic sculptures, brief storylands, and all manner of wonderments. There is nothing to win, but then again there never was. 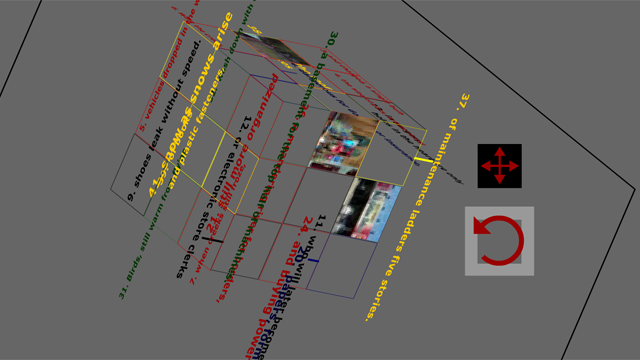 Screen based digital art often suffers from two-dimensional limitations and lacks true interaction. These cubes pioneer the use of true 3-d interactive screen based spaces. And with a total of 12 different cubes, each section explores new ways these spaces can be artistically and poetically used, from abstract to remixing found images. It is not technology making our wires, nodes and swimming data streams, our ever growing networks, beautiful. Instead it is the stories/poetics, the forever coalescing narratives that form the inter/intranet into a vitally compelling mosaic. 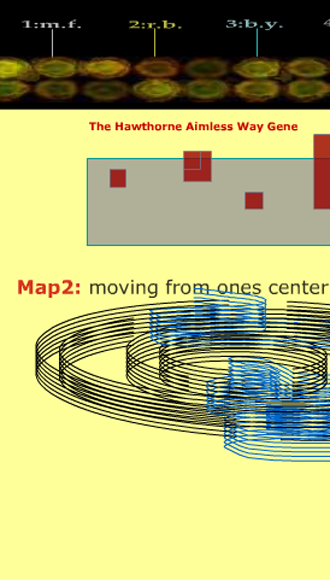 To explore, simply mouse-over/navigate to an appealing square, click and click, read, contemplate connections and repeat. 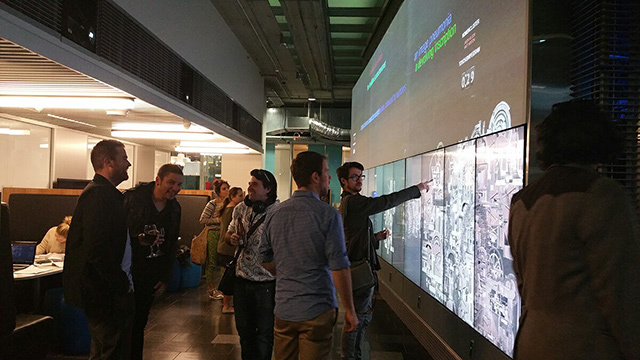 Sydney’s Siberia recreates how networks build exploratory story-scapes through an interactive zooming/clicking interface. 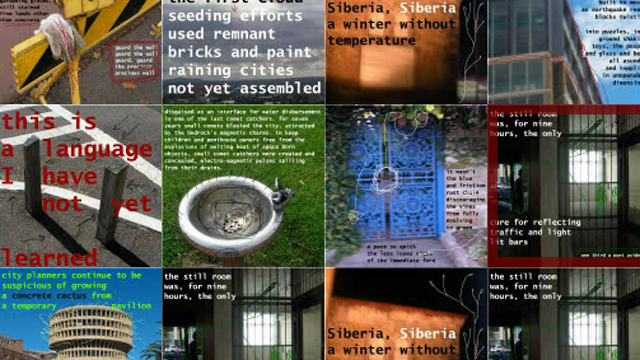 Using 121 poetic/story image tiles, the artwork dynamically generates mosaics, infinitely recombining to build new connections/collections based on the users movements. The images/texts come from exploring Newcastle, Australia as a patchwork, a complex mix of architectural tendrils, whose stories extend to and are strained by the overshadowing behemoth of Sydney to the West. Using a top down, platform engine (without gravity) EoEE is a game driven digital poem exploring various historical and contemporary texts. 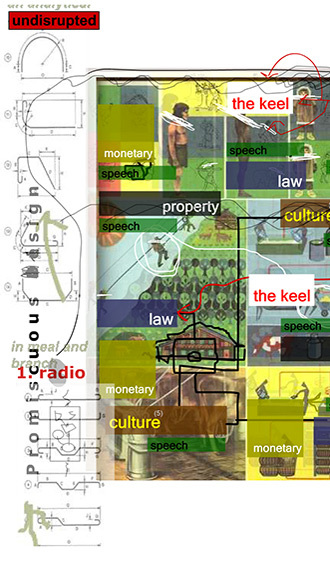 Each level’s poetic content is built from the document’s sub-sub texts and curious consequences. With Bill Gates’ letter to the Computer Brew Club about monetizing hobby computing, we find the seeds of an empire, James Joyce is caught in an infinite loop of changing texts, Fidel Castro’s boyhood letter to the US president praising America and asking for money signals an opportunistic future. With Adobe Flash losing favour among designers and device manufacturers, HTML5 JQuery and other software possibilities have started to supplant Flash’s interactive powers. This work is a sequel of sorts to my Uncontrollable Semantics. It’s created specifically for tablets and uses interactive elements which respond to cursor and swipe movement. Each of the sections is a new power, mysterious and unreachable and yet entirely engrossing. 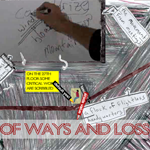 A recombinatory slot game with 15 five-line death fictions/poetics. 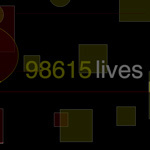 Each time the player pushes the spin button, a new death scenario comes to the screens. If the player wins more spins they can continue, if they lose, they have just forecasted their death. To create the random death scenarios, I wrote 15 short fictions, each divided into five sections: where you will die, how you will die parts one and two, and what happens after you die parts one and two. Each of these sections then become the channels of the Death Pokie machine. When all sections stop spinning, then you have a new random fiction sequence, a series of lines that form the story of your future demise. 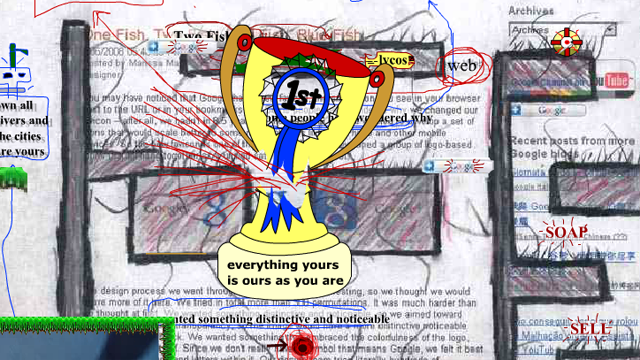 Awards/Publications: Winner of the First Annual Pan-Literary Awards, Drunken Boat Journal of Digital Theory and Practice, Connecticut State University (2006), Demonstration Hall Exhibition, Ideas Festival, Brisbane (2006), Austin Peay University exhibition on digital poetry, Texas (2008). 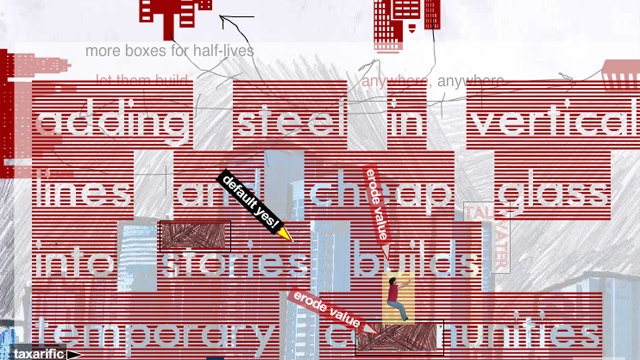 An interactive-art/ digital poetry game exploring the societal obsession with real estate investment. 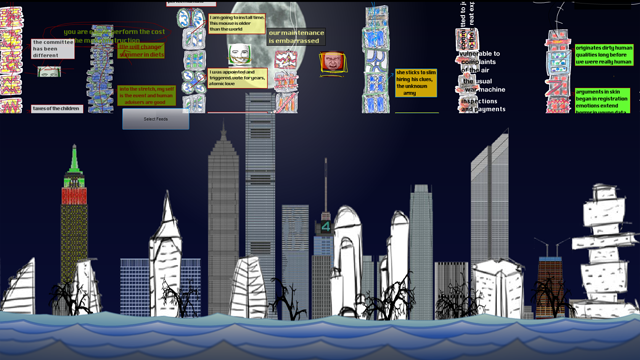 More specifically the artwork was created to examine the role of real estate in the recent Global Financial Crisis and to explore the use of game engines in digital poetry as it relates to multimedia art. The work attempts to break new ground in combining hand-drawn cityscapes as game-level designs with politically charged poetry trigger by the player/reader's movements. 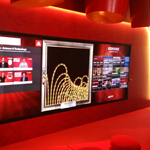 Multi-dimensional layering within an interactive depth interface. 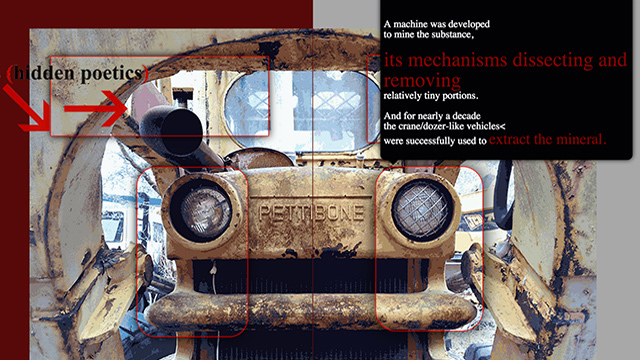 Hidden secrets and interactive layers are packaged by our obsessions with objects and their terrible dark betweens. Between Treacherous Objects explores the space between various contemporary items/ideas. For example, between the Refrigerator and the Death Bed is a heavy lines and gradual space, where eating can fill your world, ending it as well. 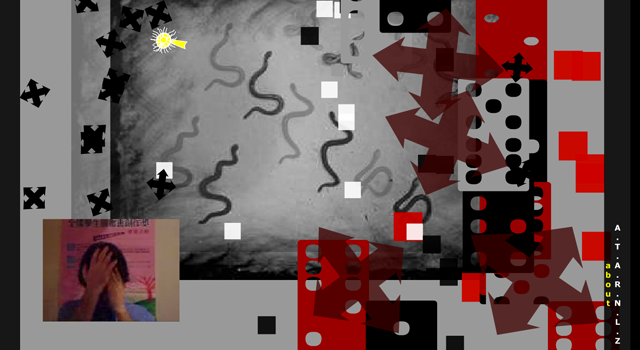 There are twelve levels, each playing with the depth of the screen, allowing the user to move in and out and around the floating space. 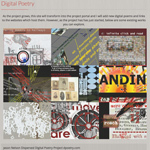 In the simplest terms Digital Poems, Interactive Fictions and Digital Artworks are born from the combination of technology and creativity, with writers/artists using all multi-media elements as critical texts. 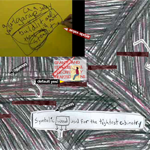 Sounds, images, movement, video, interface/interactivity and words are combined to create new poetic/artistic and storytelling forms and experiences. 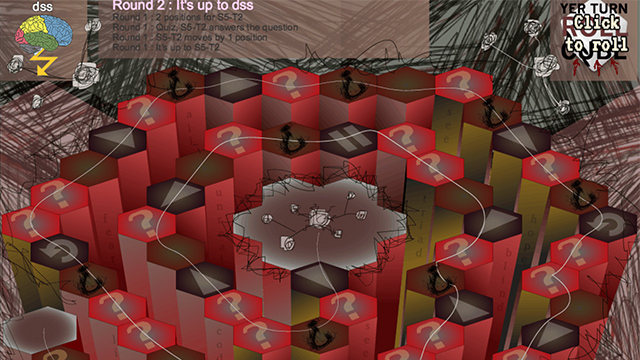 Interactive poetry cubes allowing multi-linear/dimensional play and reconfiguration. One possible reading is as 3-dimensional concrete poetry sculpture generator. The cube interface allows the reader to move the interface in 3-dimesional space, with the all elements placed on the cube transforming in proportion to the cube’s movement, perspective and warping is reasonably maintained as the cube is moved. Furthermore, each of the rows and columns can be moved to further recreate the placement and graphical nature of the poem. 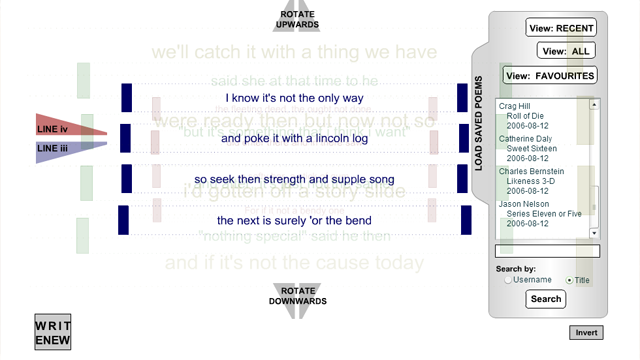 Each of the sides of the poem are colour coded to give the reader a reference point for the initial configuration of the interface, so changes become more apparent. PARAPROJECTION TEST from Jason Nelson on Vimeo. Portable (covert style) projection art via a modified projection backpack. The response from passerbys was astonishing as they were baffled about where the projection originated, with that mystery adding to their, dare I say, magical experience. 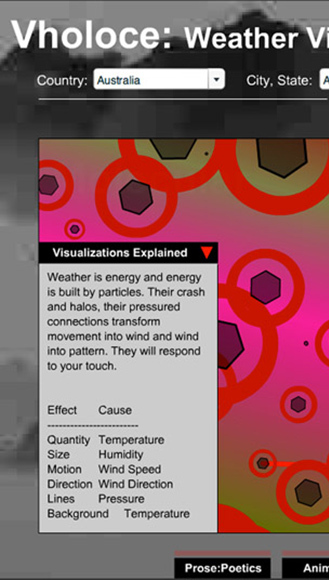 Vholoce: weather visualizer is a unique website that transforms live weather data into dynamic and interactive works of art. 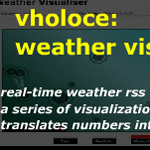 Combining meteorological science, net technologies and digital artwork, Vholoce: Weather Visualizer uses real time weather data to create a series of visualizations. The weather visualizer currently lets the user choose cities from Australia, New Zealand, Canada and the United States. With Each city's current weather conditions (numbers representing temperature, humidity, pressure, wind and weather description) are then loaded into five different visualizations Prose: Poetics, Animated, Molecular, Abstract: Noir, and Video. 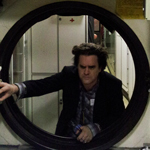 What if one person controlled a machine, and the machine controlled the world? 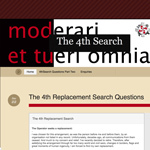 The 4th Search is an interactive quiz based fiction exploring viral methods for spreading and interacting with audiences. 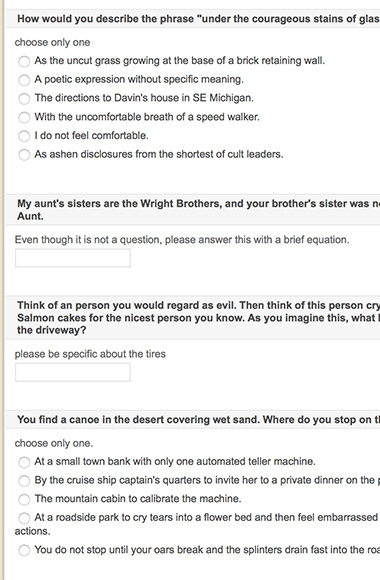 After being tweeted by Neil Gaiman, the 4th search had over 25,000 respondants to this fiction in quiz form. From the site: "I was chosen for this arrangement, as was the person before me and before them, by an organisation not listed in any record. Unfortunately, decades ago, all communications from them ceased. And much to my concern and relief, I've recently decided to retire. Therefore, after satisfying the arrangement through far too many world and civil wars, changes in borders, flags and great moments of human ingenuity, I am forced to find my own replacement. While I cannot tell you the specifics of this arrangement, I can say my daily tasks are vital to everything. And by everything I mean exactly what the word implies. Without the simple and reoccurring tasks I complete, what you know now will no longer be." Digital poetry should surround the reader, to encompass them in the experience, to entice their hands and eyes to move with the language and explore the interface. Additionally, it’s critical for digital writers to see the interface, visuals, sounds, and movements a critical poetic or fictional elements. These multimedia and interface components are not just navigational holiday lights to pretty up the place, they add/change/expand the artwork. Awards/Publications: Published in the Cordite Journal and Glassworks, and reviewed widely in such places as "I Love E-Poetry (along with most of my other works), ELMCIP and others. 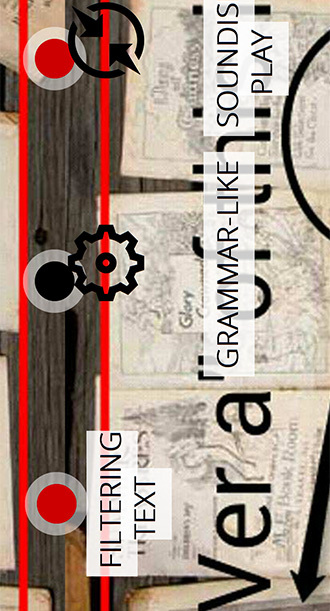 Multi-level menus as poetry generator, for when lines branch and branch. When writing a poem, often any line could generate out new directions, intersecting poems, branching possibilities. 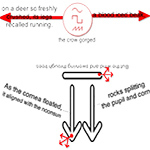 Using the modified code of a menu-sub-menu, I am experimenting with a poem within a poem within a poem. Enjambment as menu as poetic turn. A few factors I’m playing with: 1. the menu fade away timing (more or less?) 2. the mixing of various level depths 3. only one first entry, that extends to dozens of depths? 4. how else might this be used? 5. Rollover or On Press to trigger? I plan to continue with this work, plotting more complex poetic interactions between lines and nodes. 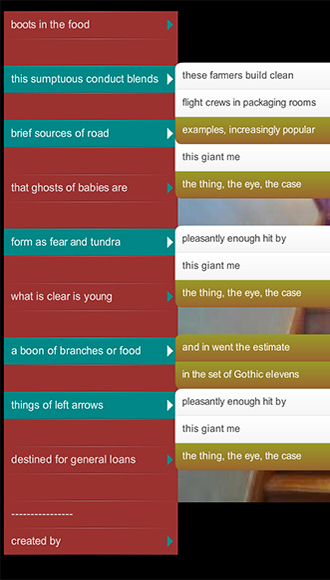 Additionally, it might be interesting to interlink two or more deep menu poems. Of course this form of non-linearity is so complex that reading must become an entirely exploratory and focus-intensive activity. The Cube allows users/poets to enter a 16 line poem, with those lines automatically placed within the multi-layered sections. 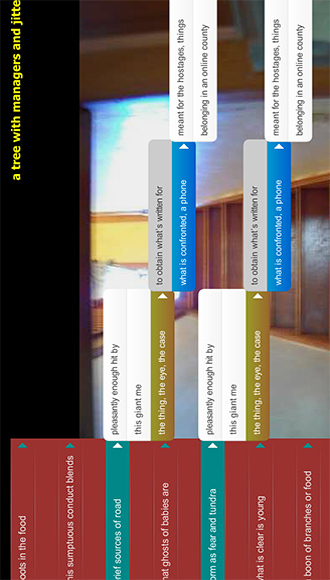 Use the buttons to move in and out, recombining the poems by turning the Cube upwards, downwards and inwards. Built to act as a bridge between the print and digital worlds. I would love to wax romantic about how all creations are important, either within a historical context or because they hold together as digital poems despite their shortcomings. And while this might be true for scholars or readers of my work, as an artist I see the first two cubes as experiments, trial runs, explorations of a form. I suppose an argument could be made about how all creations are experiments leading to the next generation of poets.I can say my intentions with the first two were firmly as playgrounds. While the last cube is an attempt at a complete work, or rather a complete interface. I make the distinction between work and interface, because most of the digital poems I create are in flux, in constant states of revision. 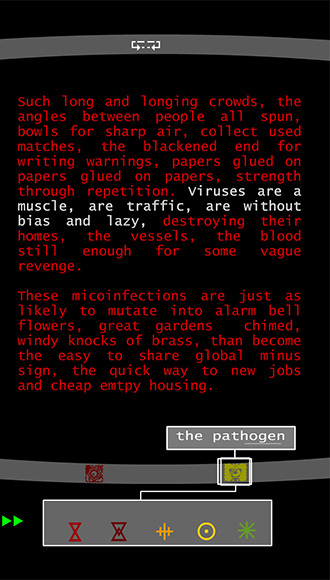 Dreamaphage is a virus. 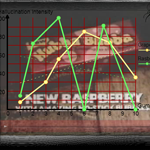 Once caught the infected have a repeating dream, and as the virus progresses the dream frequency increases until the sick go insane, lapse into a coma, or starve. This project represents a psychiatrists attempt to cure the virus by comparing the dreams themselves. The dreams are represented by online books, which not only act as a portal to the text of the dreams, but also link to other realms of science, biology and the surreal. And while the project is seemingly simple in its design, each of the books links to a wider and strange dream world. 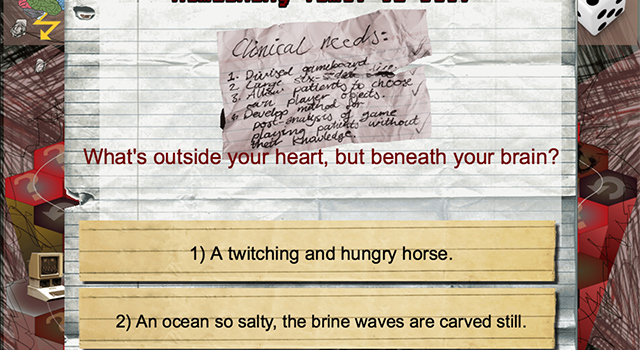 Certainly an odd mix of biology, superstition and fiction, all bundled in an interactive mix. One of my first major digital poetry works. Dreamaphage examines the impact of a fictional disease that causes the afflicted to have one constantly reoccurring dream. The work is about societies compulsion to constantly analyse the subconscious and apply medical condition semantics to anything remotely resembling the abnormal. 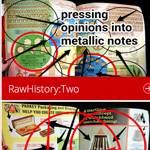 At the time, it was one of the few works to use a 3-D page interface. Awards/Publications: Reviewed extensively and included in the ELO’s first collection. Featured in many books on E-Poetry and Electronic Literature. The modern world is consumed with fears, with paranoid coverage of both real and hypothetical disaster and pandemic. Businesses flourish preparing companies for the day when half their workforce dies, and millions of chickens are burned in viral destroying blazes. With photograhs of abandoned industrial and institutional buildings as backgrounds, this artwork uses interactive spaces to explore our obsessions with microscopic species killers. 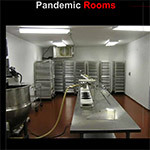 From GanterCourses.net: "Pandemic Rooms is an interactive piece of net/web artwork created by Jason Nelson that plays off of societal fears and paranoia around contracting a pandemic disease in the form of a flu virus and the ways in which society navigates those fears; both real and imagined. As the viewer interacts with Nelson’s piece, they have the option of viewing the pandemic outbreak from four different vantage points – The Affected, The Emotions, The Pathogen, and The Cleansing. 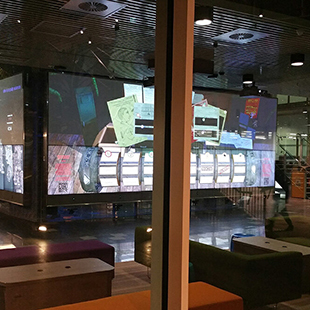 Each of the four viewing platforms contains an additional four options in which the viewer can navigate through the pandemic. Each of the sub-platforms are highly interactive and generative and allow the viewer to click and drag icons to add and subtract to and from the scene, which helps to create music and movement; while other sub-platforms are more passive in the sense that the viewer is simply meant to watch the scene unfold. Even in the passive scenes, where the viewer does not have an interactive role in creating the scene, the viewers are still able to interact with the scene by listening to and watching the pandemic unfold; through story, image and music." 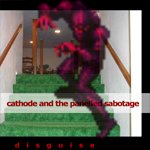 Awards/Publications: Reviewed extensively (for example in "The Plague of Language" a review by the Dispatx Art Collective) and featured in the Iowa Review Web Edition. On a trip to Ballarat, driving through the rural areas surrounding the town, I came across an crumbling church that now housed a make-shift antique store. At the bottom of a dusty book stack was a hymnal, with an inscription to a woman whose son had recently drowned. I was taken with the way water had become the music of the land in this area, how it defined so much of their lives and deaths. This digital poem creates a series of interactive poetic hymns, in part to this drowned son, and in part to the region and its own “drowning in drought”. An anthology of poems. Originally this was going to be three different works. Not able to finish those, I fitted them all together in 'selected works' mode. 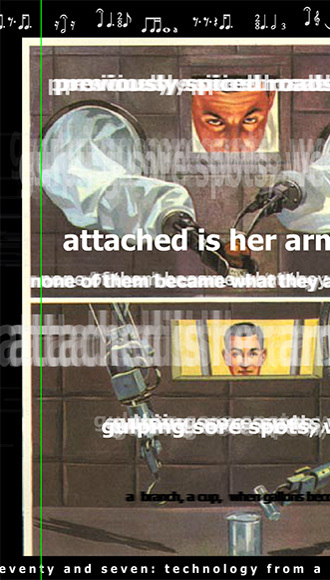 Many of the interactive devices are borrowed from other works and the texts culled from experiments gone awry. Hymns came from my thumbing through Methodist hymnals and finding the collection varied and alluringly hypnotic, not in a religious way, but rather in a 'these people are struggling to drown' way. I love the title. 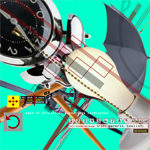 Awards/Publications: Reviewed Extensively (for example "Scripting Reading Motions: The Codex and the Computer as Self-Reflexive Machines" by Manuel Portela), published in Leonardo Electronic Almanac Special edition on New Media Poetry, MIT (Massachusetts Institute of Technology). 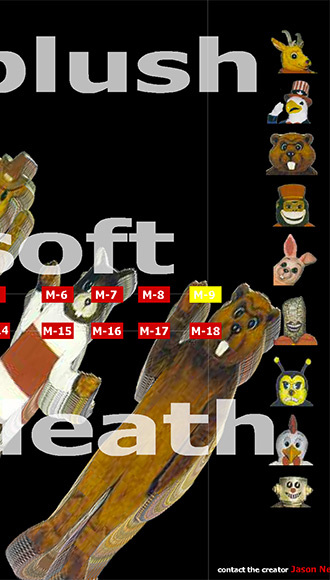 Algorithmic driven mascots. Hypnotizing stuffed and evil creatures. 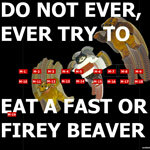 This is both humourous threat, and creepy absurdity. Oddly addictive to watch and watch and listen. Choose your favorite mesmerizing mascot and then use the center buttons to release their duplicating and re-morphing power. This project is a modified version of another of my creations called "An Introduction to the Study of Hypnotism", which explored shapes instead of mascots. Although this is one of my lease well known works, it holds a happy/curious place in my brain/heart/hands. I like to think it transcends data visualization by transforming code equations and various data inputs into a darkly humorous poetic monster. 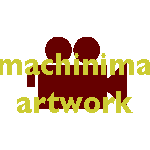 Awards/Publications: Promoted and archived in NT2 whose goal is "Promoting the study, production, reading, and archiving of hypermedia art and litterature", and exhibited in Brisbane and Seattle, Washington. Recombination, hand correction and the layering of meaning are built into this exploration of design and poetry. 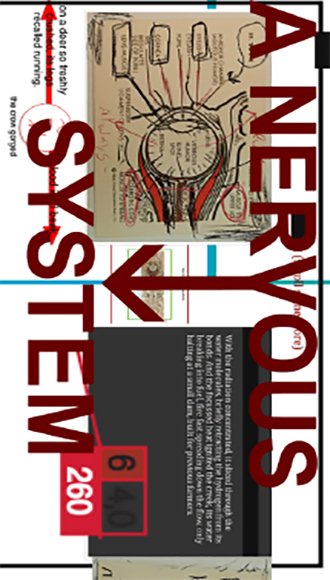 All input we sense is filtered through layered meanings. 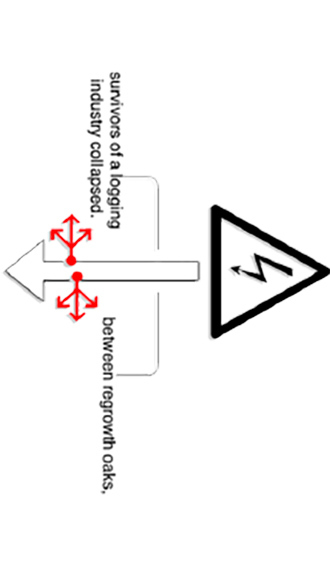 Promiscuous Design builds those various texts/sounds/movements and recreates them. 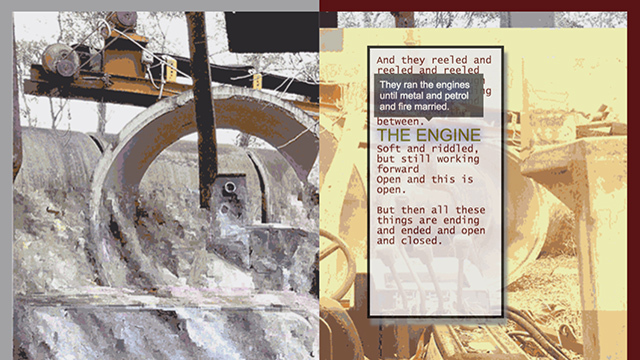 An early experiment into merging poety and abstract and collage art through an interface built to resemble a machine. Awards/Publications: Reviewed extensively (for example in "Digital Rhetoric and Poetics: Signifying Strategies in Electronic Literature" by Talan Memmott) and featured in the Digital Visions Exhibition at the University of British Columbia. 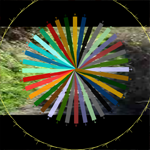 Utilizing the basic mouse-follower, Uncontrollable Semantics pulls together over fifty dramatically different sound, image and interactive environments, all through the simple mouse follower. While a simple innovation, this technique allows the user/player/reader to create their own experience, to feel the work come from the screen. 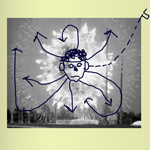 Each environment offers four directions to four terms, four semantics, four named creatures. Explore and play and confuse yourself. I often reflect on that experience when I create new digital poems. I’ve always been inclined to create works that require readers to interact to do something. As I’ve mentioned previously, interactivity makes the user part of the writing process it, lures them into the experience of the digital poem. The mouse is one of the most basic, and most immediate of computer devices for interactivity. When the hand/wrist/arm moves the work responds in kind. 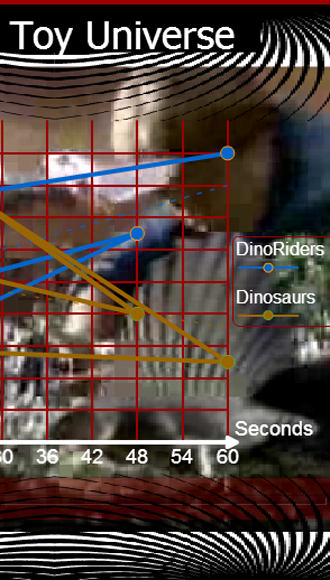 There is a satisfying and immediate physicality/ responsiveness to the mouse movement. 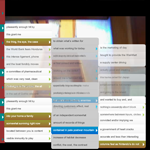 With this interface, the writer becomes a painter, driving the mouse like a brush, each click changing the color and text and multimedia elements of the palette. Text overlays text, placed on the screen at the reader’s direction. 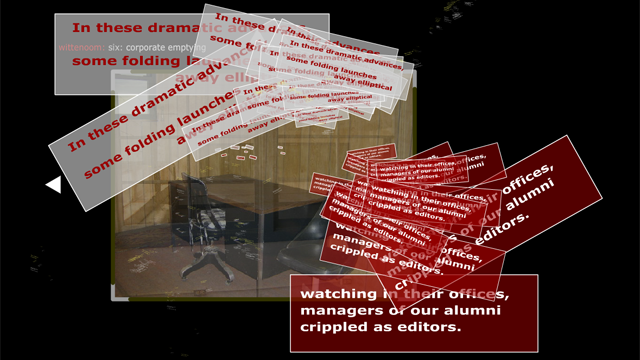 The resulting digital poem is a reader built collage. 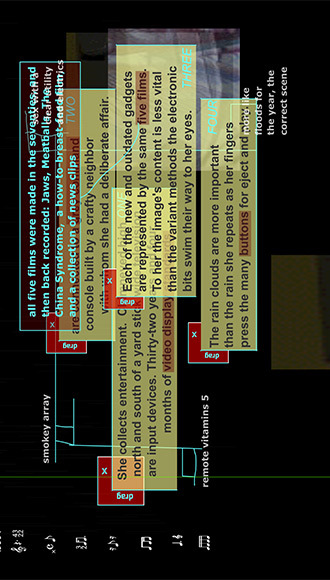 And yet the interface is not limited to the single screen, with a linear progression of elements appearing as the reader goes deeper into the poem.